Why Do I Like Working For The Party Staff? From corporate and catered events to entertaining at home, The Party Staff San Diego has earned the reputation as the most trusted name in the hospitality staffing industry. Servicing The Greater San Diego Metropolitan area and the Northern San Diego County area including Carlsbad, Escondido and Del Mar, The Party Staff San Diego provides the most experienced, best trained, food service and bartending professionals in all of San Diego County. As the industry leader in on-call hospitality staffing, The Party Staff provides a variety of back of the house positions to meet all of your culinary staffing needs. The Party Staff does it all! Sit back and relax and let the Party Staff make you feel like a guest at your next party. What type of staff do you provide? 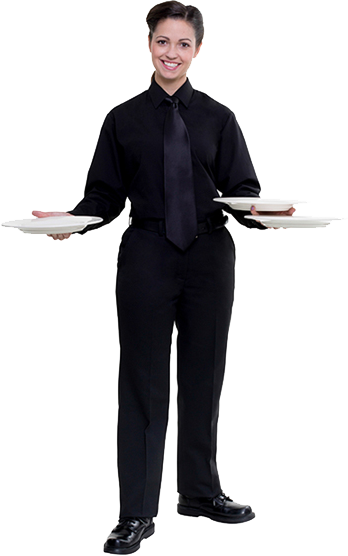 The Party Staff provides a wide range of food service positions for both front of the house and back of the house. Will the staff help with set up and breakdown? Party Staff employees will do anything that is asked of them, as long as it falls within their general job description and does not jeopardize their safety. Are your bartenders able to help with serving? All of our bartenders are cross-trained to do service work as well. Can I get the same great staff back at my future events? Absolutely. After every event, a Party Staff office team member will contact you for feedback on the staff. Staff whom you liked and performed well can be added to your request list and staffed on your future events, as much as possible. You can also add staff to your personalized request list through your online account. What if I have an event that requires Party Staff's best of the best? The Party Staff's Platinum Staff are our top ranked, most experienced employees, capable of working alone or with little or no supervision. When you have special needs that may require VIP staff or you request a Platinum staffer by name, your TPS office team representative will be glad to assist you when you place your order. Please note, when ordering Platinum Staff, additional charges will apply. Does your staff need direction or can we just turn a party over to them? We provide party captains and event managers who can run your event from start to finish. But if your event does not require that level of staffing, providing a well written time-line and a clear description of your needs communicated clearly to the staff at the start of your event is all that's needed for our staff to carry out their duties responsibly. How much experience does your staff have? What are your office hours of operation? Party Staff offices are open Monday through Friday from 9am to 6pm. A Weekend Manager is on the premises Saturdays and Sundays and/or available by emergency pager or cell phone. What if I need to place an order or change an order outside of regular business hours? A Party Staff client services representative is always available after hours by emergency pager or cell phone. What kind of insurance does Party Staff have? The Party Staff employees are covered with full Workers' Compensation insurance, five million dollars in general liability insurance and one million dollars in liquor liability insurance. In addition, for the further protection of our clients, we carry one million dollars in employment practices liability insurance. Do you provide any party equipment rentals, liquor or bar supplies? We're strictly a residential and corporate event staffing company. We're happy to refer you to companies in your area that provide those services, but staffing is our specialty. That's all we do. If I have an upcoming event but am unsure about all of the details, should I place an order or wait until later? Event particulars can always be changed. It's always a good idea to place your order as soon as you're certain that you have a need for staff on a specific date. Can you fill last minute orders? Yes, we're last minute staffing specialists! There may be rare occasions when we are sold out and unable to meet specific needs, but that's the exception not the rule. What is The Party Staff's cancellation policy? Check with your Party Staff office for details. Click here for locations. How does The Party Staff bill if my staff is not released exactly on the hour? We bill in 15 minutes increments, rounded up or down depending on exactly the time the staff leaves. Our corporate and catering rates are based on volume and frequency of use. Contact your Party Staff office for a quote. After setting up an account with your nearest Party Staff office, all that's required is your email address. Click Benefits to view all the features of Client Internet Account Access. Can you help me determine how many staff I need? Absolutely. Call your nearest Party Staff office and a TPS office team member will be happy to discuss your event in detail and help you determine the staffing solution that will meet your needs. Click our Staffing Calculator for a quick reference guide. Since 1989, The Party Staff has established relationships with national food service management companies such as Sodexo, Compass Group, Aramark, Guckenheimer and more. We also provide exceptional staff to a wide spectrum of clients including the top catering companies, hotels, resorts, colleges, and movie studios as well thousands of residential clients who entertain at home. How many staff will I need? Staffing will depend on the style of service and the number of guests at your party. Please call or email The Party Staff location near you. An office team member will be happy to discuss the details of your event and assist you in determining the quantity of staff that's right for your event. For a quick reference, refer to our staffing calculator or our staffing guidelines under Party Tips. Are you also a caterer? Do you provide food & drink? The Party Staff excels by focusing only on staffing. We don't provide food, beverages or rentals, but we're glad to refer you to companies in your area that provide those services. We're strictly a corporate event and residential party staffing company. When should my staff arrive? Generally, we suggest your staff arrive 30 minutes to one hour prior to your guests' arrival. It is recommended that staff arrive earlier if they are expected to help with setup and/or décor, or if they will be preparing the meal. What can your staff do? Are they experienced? Our servers, event captains, bartenders, and cooks can execute any type of event - from elaborate weddings to intimate dinners. Whether you are working with a caterer, having your favorite restaurant deliver food, or preparing the meal yourself, having just one or an entire team of Party Staffers on hand to take care of service allows you to relax and enjoy your special event. All of our employees have an average of one year experience in the catering/food service industry. We only send our most experienced and personable staff to residential parties. Do you have chefs who can create and cook a menu from scratch? Yes, in addition to our prep cooks and grill cooks, Party Staff employs executive level personal chefs who can work with you to create and cook a complete customized menu for your special event. Please inquire well in advance if you are in need of a Personal Chef. What do your bartenders bring with them? Our bartenders arrive with a bar kit consisting of a martini shaker/strainer, ice scoop, a pint glass, mixing spoon, wine opener, speed pourers, bar towel and a small cutting board with fruit knife. Please note: Party Staff does not provide beverages of any kind, ice, or fruit or other garnishes. Click on our bar recommendations for suggestions about bar supplies for your event. What do cooks bring with them? Cooks arrive with a knife kit and dressed in chef whites. Why is it advisable to order an event captain? On larger parties or events with an intricate time line (like a formal sit down dinner) Party Staff Event Captains have the leadership experience and problem-solving skills to ensure your event runs seamlessly. What are your hourly rates? Do you have an hourly minimum? Hourly rates vary depending on the job description. There is a five hour minimum on all residential events. Please contact your nearest Party Staff office for rates in your area. How do you handle billing? When we take your order we will ask for all of your pertinent contact information as well as a valid credit card number to confirm the order. The office holds the card number on file. It is never shared with the staffer(s) working the event. Depending on the number of staff you need, a deposit may be required. I need a bartender tonight/tomorrow/this weekend! Do you have anyone? With the exception a few busy nights per year, Party Staff often has the ability to accommodate "last-minute" orders for staff so please don't hesitate to call your local Party Staff office and inquire today. The hourly rate does not include any gratuity for our staff. Tipping is always at your discretion. If our staff meet or exceed your expectations, we suggest a gratuity between 20%-30% depending on your level of satisfaction. You can pay the staff directly in cash, or the gratuity can be added to your final credit card. What if my plans change? What is your cancellation policy? Please contact your office of The Party Staff immediately. Let us make your next event extraordinary. The Party Staff's unique ability in providing well trained staff to be commended. We look forward to our continued business relationship. You definitely fulfill your company's motto of 'Exceptional People, Extraordinary Service'. …over the past several years your dedicated employees have contributed greatly to our company's success. Party Staff has become an invaluable part of our team, and we look forward to a long and prosperous partnership. Thank your staff for the unbelievable job they did at my home this past weekend. Impressed would be an understatement. They were extremely, respectful and professional and went above and beyond the call of duty for me and my family. Your staff that worked our holiday party was outstanding. They were pleasant, professional and super attentive to all my guest’s needs. You’re the best! Your service is invaluable to me. I’ve tried hiring my own employees but it’s just not cost effective. I really appreciate that you are there! Your staff was outstanding! They arrived on time, in proper attire, did a professional job and worked hard until the very end. I wouldn’t hesitate to recommend your company to anyone in the hospitality field. © 2019 The Party Staff, Inc. All Rights Reserved.